One of our recent website development projects has been named a winner in the 2017 Communicator Awards competition. 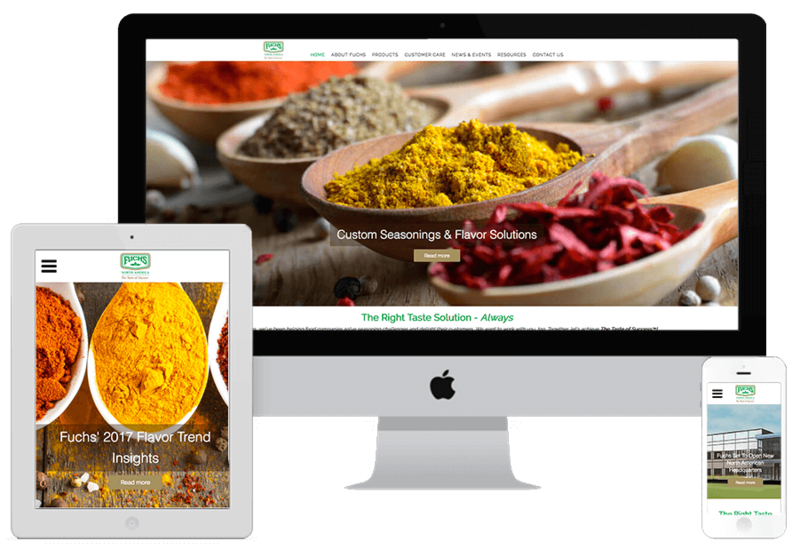 An Award of Excellence was won by Mullin/Ashley for a new website designed and developed for Fuchs North America, a manufacturer of seasoning and flavor systems (Hampstead, Md.). The new website showcases how Fuchs develops custom seasonings that go into snack items, prepared foods and many other products. Optimized for mobile viewing, the Fuchs website also contains extensive content about the latest consumer taste trends. Fuchs North America is a leading maker of seasonings and functional ingredients for the food processing and foodservice industries, having longstanding relationships with many of the world’s most important food brands. The company is also a supplier of quality spices sourced from all over the world. In addition to manufacturing, Fuchs North America charts new and emerging taste trends and provides those insights to its customers, enabling them to introduce products that pique consumer interest and generate new food sales. Fuchs product offerings such as its African Exploration Summer Sensations Collections showcase these compelling new flavors and serve as the basis for developing custom seasonings and ingredients that turn into winning new products for Fuchs’ customers. The Communicator Awards is an annual international competition honoring creative excellence in the marketing communications industry. Conducted by the Academy of Interactive & Visual Arts (AIVA), the competition honors the very best work in corporate communications, advertising and public relations related to interactive media, audiovisual and print programs. Now in its 23rd year, the Communicator Awards is one of the largest international marketing communications competitions of its kind. Overseen and judged by AIVA, the 2017 competition attracted more than 6,000 entries submitted by advertising and PR agencies, corporate communications departments, graphic designers, writers, and web developers.